One of my deciding factors when it comes to luxury handbags is the resell value. As much as I love my bags, there will always be newer and better material things. Before making a purchase, it's important to know if that purchase will retain its value down the road. 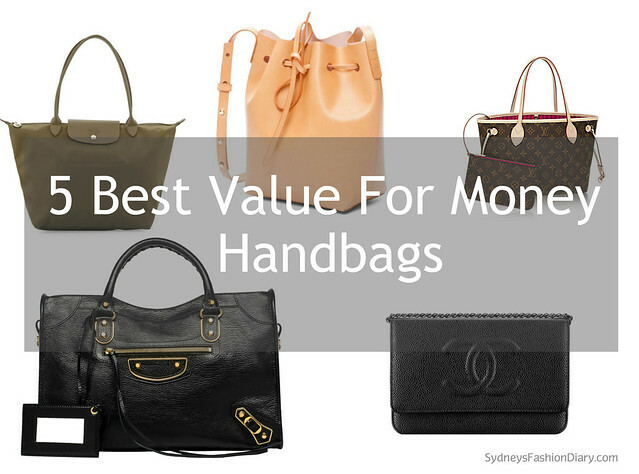 I did a ton of research and have selected 5 best value for your money handbags ranging from under $500 - under $2000. I own 2 out of the 5 below and can personally tell you their resell values are phenomenal. 1. Longchamp (under $500): If you're just starting collecting designer handbags, Longchamp is an excellent brand. Classic pieces with reasonable prices and wonderful craftsmanship. I bought this Longchamp bag 4 years ago to use as a diaper bag and ended up selling it for 35% off the retail (I got this travel tote as a replacement). For a bag that is 4 years old, I say the resell value is pretty great! 2. Mansure Gavriel (under $1000) - For under $1000, I think Mansure Gavriel is a fantastic brand. I don't own a Mansur Gavriel but would love to one day. If you're familiar with the brand then you know their handbags have been known to sell out within hours of being restocked. Overpriced eBay listings mean items in high demand. 3. Louis Vuitton Neverfull (under $1500) - For under $1500, I would go with the classic Louis Vuitton Neverfull. I do not own this because am not into logo designer handbags anymore. This tote is a timeless classic that will stand the test of time and retain its value. 4. Balenciaga (under $2000): For under $2000, the Balenciaga city bag is also a timeless classic piece. I am normally a "structured bag" kind of girl but can see why the city bag is of the most coveted bags. I appreciate the fact that Balenciaga releases some of the most vibrant colors. I hope you find this post helpful. Let me know if you have any questions in the comment section below. Happy Friday! Hi Sydney! Great post as always! Have a wonderful weekend! I'm ready to sell my LV Speedy but can't because my husband bought it for me & he'd be sad I'd want to get rid of it. Great post! The longchamp is such a great diaper bag because of the zipper. I love the olive color you're showing here, too! I would so get it when I have a baby! I always feel like the Louis Vuittons logo bags are not worth it since they're made out of canvas. But the logo look is kinda growing on me...I'm thinking about getting a logo wallet haha.